Thursday September 20th 1923 I was home all day helping Hattie sew. It rained nearly all day. I wrote to Ida in the evening. 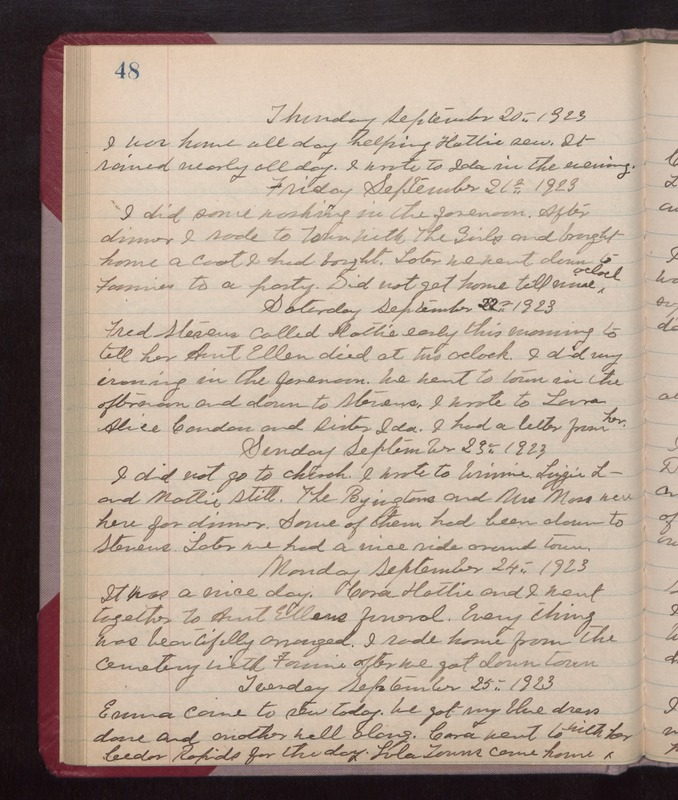 Friday September 21st 1923 I did some washing in the forenoon. After dinner I rode to town with The Girls and brought home a coat I had bought. Later we went down to Fannies to a party. Did not get home till nine oclock. Saturday September 22nd 1923 Fred Stevens called Hattie early this morning to tell her Aunt Ellen died at two oclock. I did my ironing in the forenoon. We went to town in the afternoon and down to Stevens. I wrote to Laura, Alice Condon and Sister Ida. I had a letter from her. Sunday September 23rd 1923 I did not go to church. I wrote to Winnie, Lizzie L-- and Mattie Stitt. The Boyingtons and Mrs Mossmen here for dinner. Some of them had been down to Stevens. Later we had a nice ride around town. Monday September 24th 1923 It was a nice day. Cora Hattie and I went together to Aunt Ellens funeral. Every thing was beautifully arranged. I rode home from the cemetery with Fannie after we got down town. Tuesday September 25th 1923 Emma came to sew today. We got my blue dress done and another well along. Cora went to Cedar Rapids for the day. Lula Towns came home with her.